Alderac Entertainment Group will release Smash Up: That 70s Expansion, a standalone expansion for its popular shuffle-building game in March. 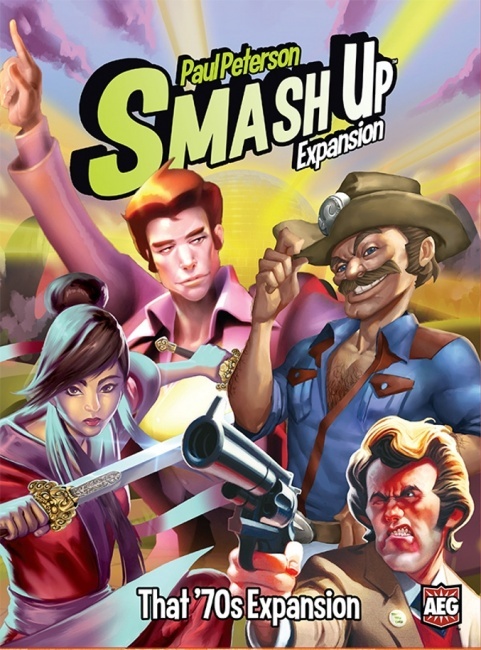 Smash Up is heading back to the dy-no-mite 1970s with four new factions: Disco Dancers, Truckers, Kung Fu Fighters, and Vigilantes. The Disco Dancers know the power of dancing together, and when they copy each other�s moves � watch out! The Truckers transport themselves and their load across all bases, while sticking it to corrupt law officials. The Kung Fun Fighters transfer power like a river between themselves and are adept at taking it from their enemies. The Vigilantes deliver hard-nosed justice with no regrets. This expansion is compatible with all other Smash Up sets. The box contains 88 cards (four 20 card faction sets, 8 base cards), 4 dividers, a token punchboard, and a rulebook. The game is for 2 players, ages 12 and up, and plays in 45 minutes.